Looking for the biggest paintball field in Minnesota? 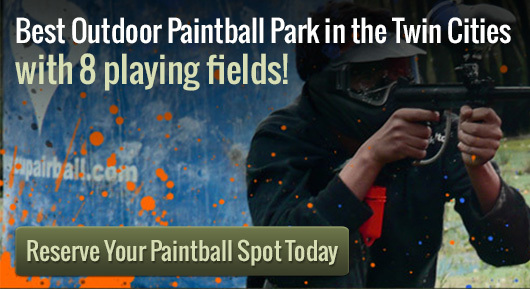 The Action Packed Paintball Games in Minneapolis and Twin Cities is a premiere paintball park. Inside the park there are 8 different paintball fields to fit any style and preference. The fields include the City of Tombstone, Firebase Alpha, Speedball, Civil War, The Jungle, Badlandz and Woodsball Fields. The wide selection of paintball fields allows for several scenarios and an entertaining paintball game. Walk-on play is offered for individuals and groups of any size. Action Packed is the biggest paintball field in Minnesota and the best outdoor paintball field. It offers private reservations with events and parties. It could range from a birthday party to a bachelor party. Players of nearly any age can play paintball. There are various paintball fields. The City of Tombstone field is an old western town with rooms. In the Firebase Alpha field, players are trapped and have to fight to make their way out. The Speedball field is an air-ball field for adrenaline seekers. In the Civil War field, players line up to combat against each other. The Jungle paintball field allows players to explore the deep jungle. The Badlandz field is similar to the Desert War and is all about staying hidden. The last field is the Woodsball Fields and it is a wooded field to make for a very fun game of paintball. Players can easily take cover in the brush. It is obvious that The Action Packed Paintball Games is a favorite for many reasons; including the fact it is the biggest paintball field in Minneapolis and Twin Cities. It has several outdoor paintball fields to fit all players? preference. Players can go from roaming the streets of an old western town to exploring deep into the wild jungle. Players are allowed to bring their own equipment to the biggest paintball field but they have to use the paint provided at The Action Packed Paintball Games.